Traditional Entry by Dallas Landscape Contractors Southern Botanical, Inc.
Well, another season has come and gone. Now, you are probably getting your self ready for the fall and winter that is to come – cleaning gutters, winter proofing windows and doors, and raking the fallen leaves. But, what is one to do to have something nice to look at during those bare tree months? Well, one way to create some visual interest is to focus on the holidays. As everyone knows, Halloween, Thanksgiving, and Christmas bring a vast amount of lawn ornaments and decor. So, why not take advantage of it to help get through the rest of the years. Strategically placed bales of hay are a popular choice for this time of year. 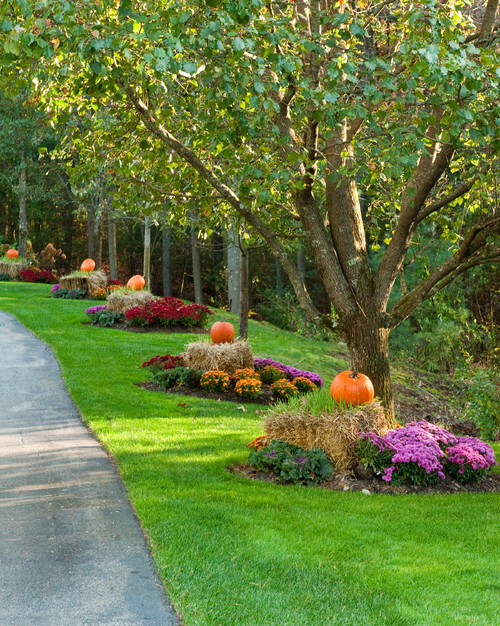 You can decorate them with pumpkins, gourds, and plants that are well adapted to the cooler autumn weather. 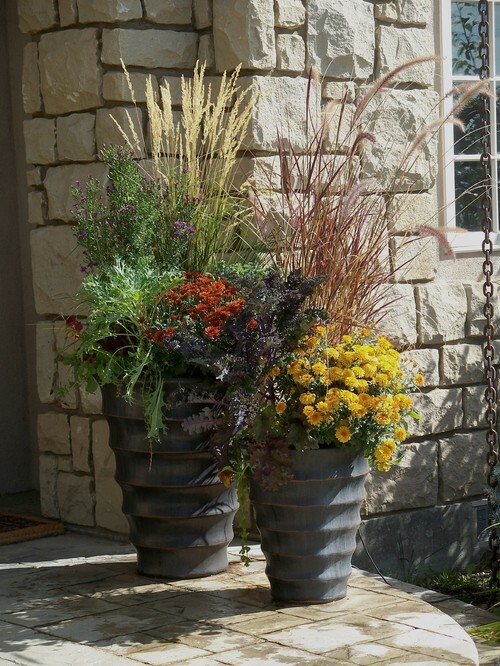 This is always a good choice because it can provide a nice splash of color in an otherwise flowerless area. 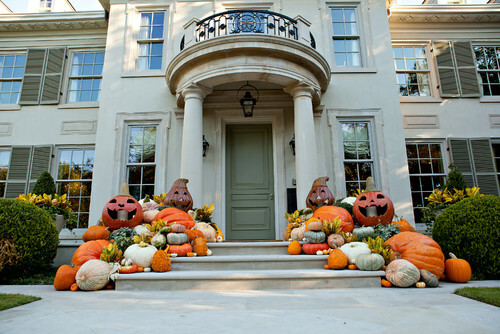 If you are not a fan of the hay bales, pumpkins and gourds can be displayed in other fashions. Why not try an old wagon or a basket. 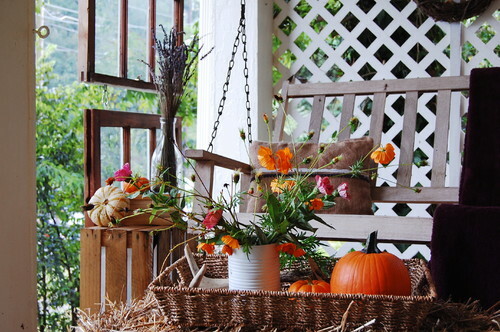 Fill it with a selection of your favorite flowers and several pumpkins. 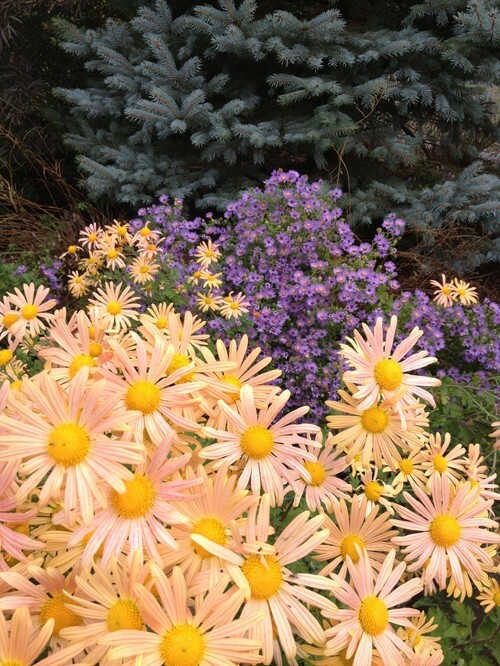 Mums , pansies, and asters are popular floral plants that provide beautiful blooms during this time of the year, and there are several ways to incorporate these gems into your landscaping. 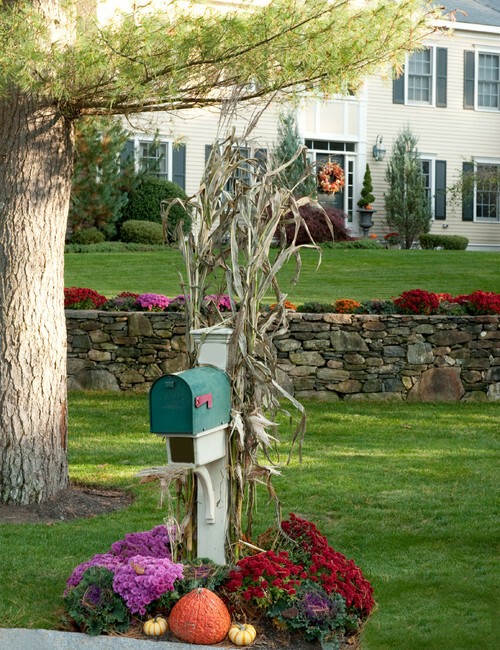 Line a border or a mailbox with potted mums. To make it easier, you don’t even need to transplant them. Just maneuver the pots down beds and pull the mulch over the pot . Or, if placing them in a location where there is no mulch, a bundle of pine needles will do just as nicely. Pull the needles loose and use them to hide the containers. No one will ever know, and you will have an instant flower bed. Don’t have flower beds? 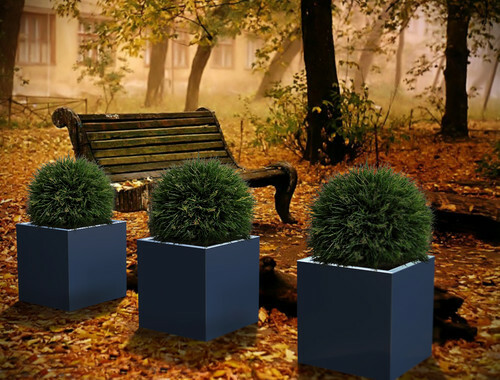 Not to worry, you can always use your favorite containers to add that splash of fall color. These containers have a mix of mums, pansies, asters, grasses, and even some kale. The great thing about containers is that when the fall season ends, you can change over to winter season plants. Don’t forget about those window boxes. 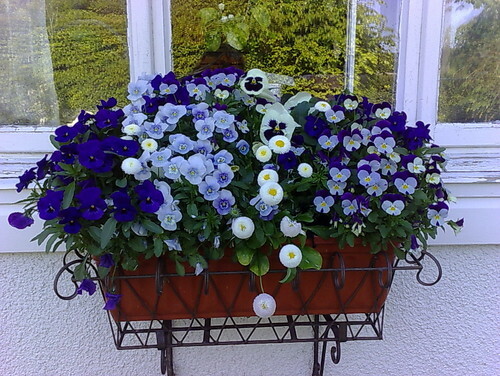 This is the perfect place to display some pansies. Want something a little different. 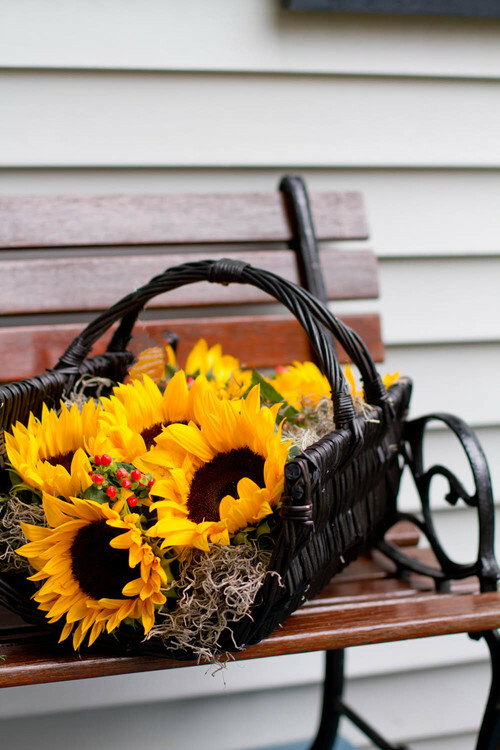 Why not try out a basket of sunflowers to dress up a porch or a bench. They don’t even have to be living sunflowers. Artificial will look just as nice in a pinch. One other thing, fall landscaping just wouldn’t be complete without the raking of the leaves, but I thought it would be nice to show you how beautiful the fallen leaves can be.